In the nascent solar system, the building blocks of terrestrial planets – asteroids of dozens of kilometers in size – were internally heated by the decay of radioactive elements. The amount of radionuclides present in a single asteroid determined its internal structure. In extreme cases the heat could be so intense that large parts of the body melted completely and differentiated into a metallic and very dense core and surrounding mantle with less altered material at the surface. In a new study PlanetS researchers from ETH Zürich mapped the influence of the starting conditions of planetesimals on its long-term interior evolution using geophysical computer models. They also explored if the initial porosity of the bodies, which is usually assumed to be high, significantly affected the results. 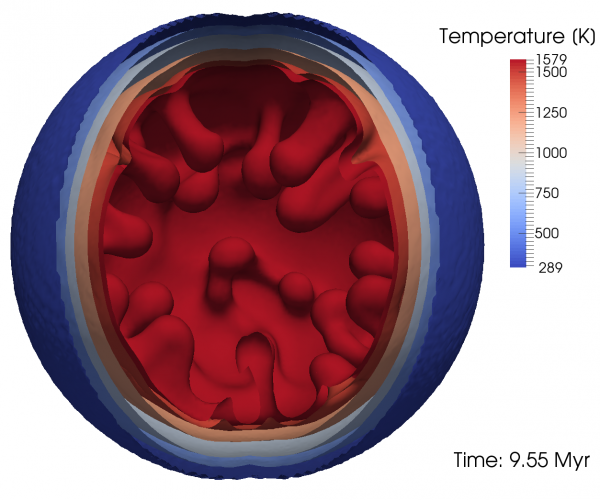 The simulations showed that the insulating effects of porosity were significantly reduced by rapid melting inside the asteroids – the pores within the rock matrix filled with liquid magma. They could show how the internal evolution and structure of the planetesimals depended mainly on the initial radius and the formation time of the body: the earlier formed and the bigger the individual asteroid the more radioactive materials were inherited and therefore heating, melting and differentiation were enhanced. The results of the study touch many aspects of current planet formation models and can help to better interpret laboratory data from meteorites. In the context of exoplanets it will be crucial to understand how radioactive heat sources are distributed among other systems, so that the results obtained for the solar system can be extrapolated to extrasolar systems.